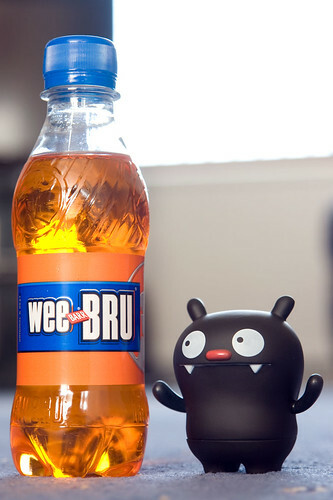 Uglyworld #633 - Wee Bru & Big Toe = Perfect (188-365), originally uploaded by www.bazpics.com. This morning Scottish Babo woke me up to tell me that she had managed to arrange a special surprise for Big Toe who also travelled to Scotland with me (he has been a little sad that it's only a 2 day visit while I'm over in the UK with business). Back to the matter at hand, Babo's surprise - to say Big Toe was surprised would be a total understatement as he officially used a phrase Ice-Bat loves to call all his own "WOWZERS!!!". Ox was a little confused as he looked on as to how Big Toe can be BIG, the Wee Bru can be WEE but they are infact the opposite way round. Babo thankfully answered that one without any need of assistance, "Is justs how the worlds is, somethings is smalls and somethings is bigs, it's what makes us alls special!". Ox nodded in agreement, meanwhile Big Toe was already tucking into his wee bru with a massive smile on his face.